An earthy mushroom-pesto sauce goes perfectly with a pan-roasted steak for a perfect dinner. Mushroom Pesto SteakHeat a nonstick skillet over medium-high heat. Coat with olive oil spray. Add mushrooms and cook 1 minute, turn, and cook 1 minute longer. Transfer to a food processor and add the water and pesto sauce. Blend until smooth. Set aside. Add the steak to the same skillet. Sear over high heat for 1 minute, turn, and sear 1 minute. Turn heat down to medium and cook 5 minutes for rare. A meat thermometer inserted in the thickest portion should read 145 degrees. For medium doneness, cook another 2 minutes (160 degrees). Sprinkle the steak with salt and pepper to taste and spoon the reserved sauce on top. Use the same skillet for the Hot Pepper Potatoes. Place watercress on the plate for a garnish. Hot Pepper PotatoesWash potatoes. Slice in half (do not peel). Place in a large saucepan and fill with cold water to cover the potatoes. Bring to a boil over high heat, cover, and cook 10 minutes, or until potatoes are cooked through. Drain. When steak is removed from the skillet, add the olive oil and hot-pepper sauce to the skillet. Heat over high heat. Add the potatoes and toss until crisp and golden, about 3 minutes. Add salt and pepper to taste. Serve with the steak. 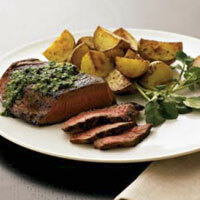 Variation: Any type of quick cooking steak can be substituted for sirloin: flank, skirt, or strip. Variation: Yellow or red potatoes can be substituted for baby yellow potatoes; cut the bigger potatoes into 1-inch pieces. Cooking Tip: Use the same skillet to cook the mushrooms, then the steak, and to finish the potatoes.